Bulgarian pride on a plate! Last year in the summer I had the chance to visit Bulgaria on a business trip. I was overwhelmed with the hospitality of my Bulgarian colleagues and they introduced me to something very simple but oh so tasty – the Shopska salad. Shopska is a rustic salad that is quite common in the whole Balkan region and is usually enjoyed together with the local spirit Rakia. Rakia is a kind of grappa that packs a serious punch. If you go to a proper Bulgaria restaurant you might just have the luck to enjoy their homebrewed moonshine that will probably knock your socks off! When I heard that you have to have the salad with the local drink I was intrigued. I still don’t completely understand why they both go so well together, but hey, either you have an excuse to drink while eating a salad in the afternoon, or you have a drink and get in some veggies. Whatever your reasoning, you won’t be disappointed! Create a fresh and satisfying salad! Chop the cucumber, the tomatoes and the green bell pepper. Finely dice the onion. Chop the parsley. Whisk the white wine vinegar together with the oil until well combined. Give a seasoning with salt and pepper. This is your dressing. Mix your chopped and diced vegetables with the parsley, the black olives and the dressing. Once everything is combined and coated with the dressing, divide the salad among 2 plates. Crumble or shave the cheese over the salad and garnish with some more parsley. 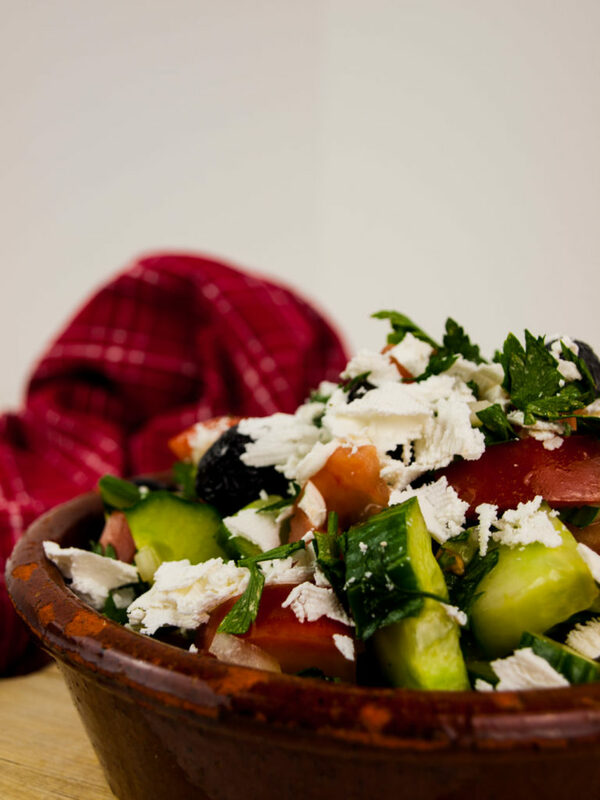 Serve your Shopska salad and don’t forget the ice-cold Rakia alongside! Let me know what you think about the recipe in the comments below! Have you ever had the chance to taste a proper Shopska salad (with rakia) before? Think my take on it missed something or the balance is somehow off? Let us know underneath and let’s make this recipe as authentic as can be!